We come now to Tom Baker’s second season as The Doctor, and as the stories progressed we start to see his costume develop and expand into a wardrobe of clothes rather than a single set outfit. 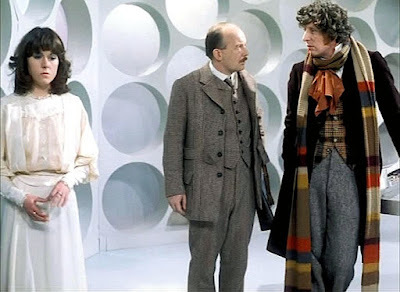 By halfway through the season we shall see the emergence of the frock coat - an iconic look that will be followed through in subsequent regenerations. 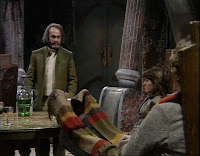 The story opens with The Doctor once again wearing the baggy brown overcoat, which was presumed lost in the vortex between Genesis Of The Daleks and Revenge Of The Cybermen. Humm. In honour of their Scottish location, he also wears a Tam o’Shanter hat and tartan scarf (while Harry is seen wearing The Doctor’s trademark scarf, and Sarah is wearing his Fedora). He quickly reverts to his usual costume, though the shirt is now plain white; the neckerchief is replaced by a green cravat; and the cardigan has been replaced by a printed velvet waistcoat with a bold Prince of Wales check design. This waistcoat will become a near constant in The Doctor’s wardrobe, while coats, scarves and trousers will be often replaced. 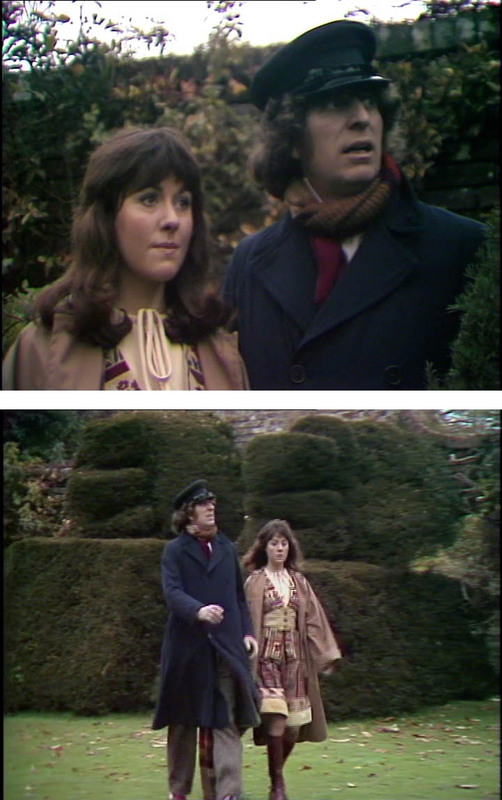 In the closing scene the baggy brown overcoat reappears. 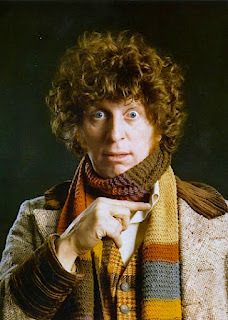 NB: His scarf has now lost a significant portion from one end, becoming what DoctorWhoScarf.com designates the Season 13 scarf. Despite having lost almost 14% of its row count from its debut in Robot, it appears to be more or less the same length due to having been reblocked and stretched. 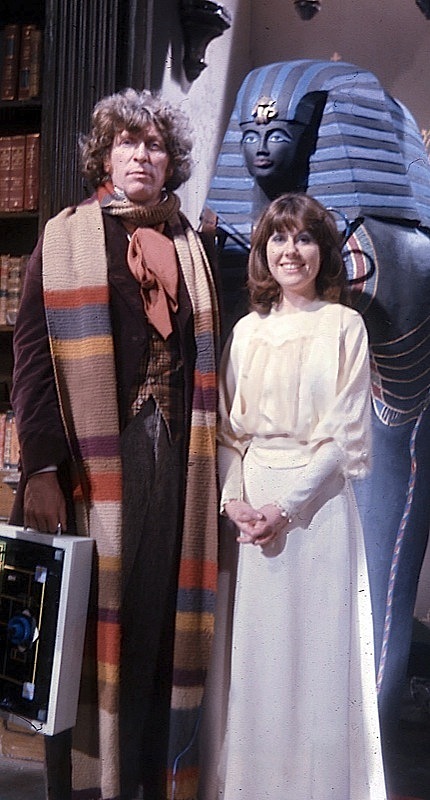 The Doctor continues to wear his original basic costume, though there is a visible change in how he wears it. 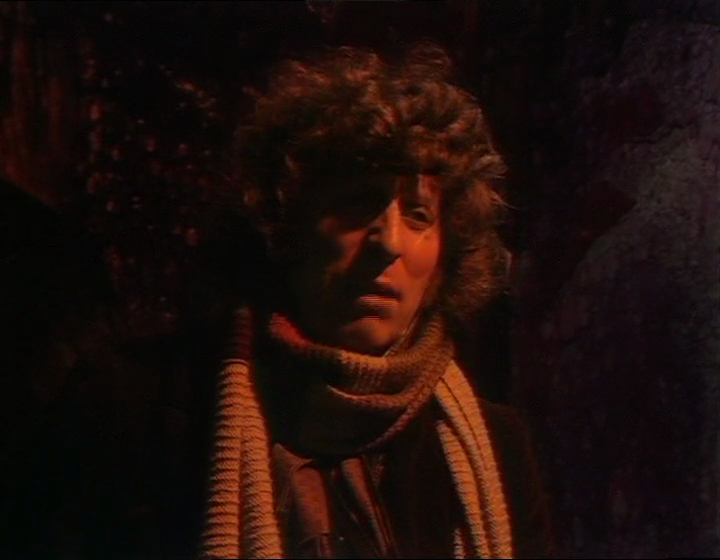 The Fedora is not scene at all during this adventure and the scarf is ditched at the TARDIS during episode 2 and not worn for the rest of the story. It appears that for the filmed inserts a blue cravat was worn (see left), but a terracotta one for the studio-based scenes. 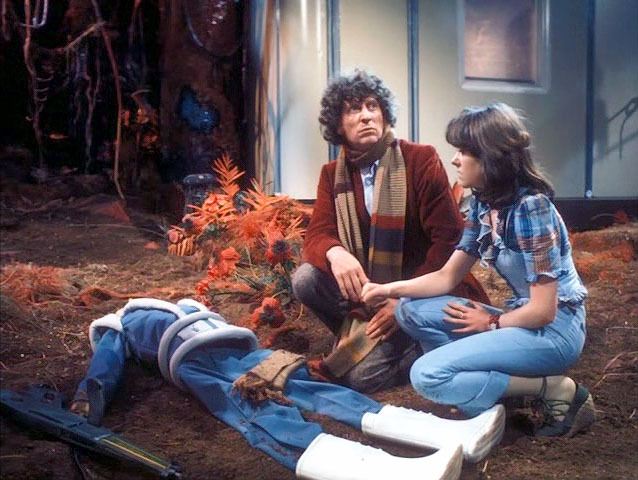 We get a couple of close-up views of part of the costume, and see the shoes clearly (and beige socks) as well as a good view of the curious flapped pocket on the left sleeve of the jacket. This is the final time the shooting jacket is ever worn. 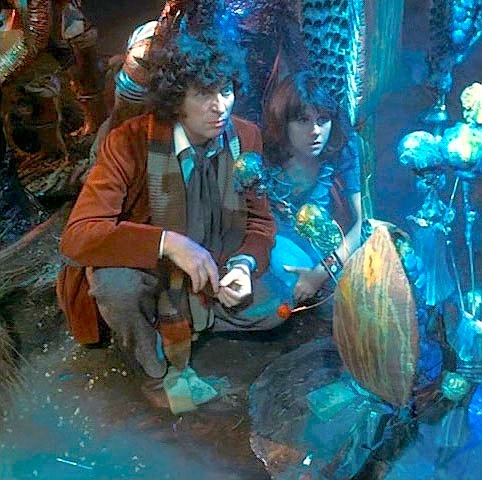 This adventure marks a subtle but landmark change in The Doctor’s appearance and style. The corduroy shooting jacket has now been permanently retired, to be replaced by an Edwardian-sytle burgundy velvet frock coat. It has a 3x3 double breasted front, though not designed to be buttoned up. The lapels are large and pointed with three buttonholes on each side. The skirt of the coat has two large pockets towards the back. A new period-style shirt with a stand-up collar completes the look. 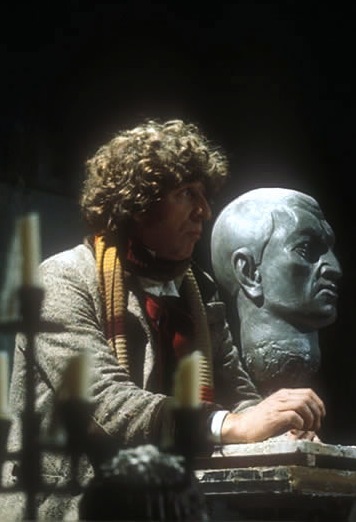 Curiously, in episode 4 the studio lighting shows up a woven checked pattern in the terracotta cravat (see below), despite it not showing in any quality publicity photos. 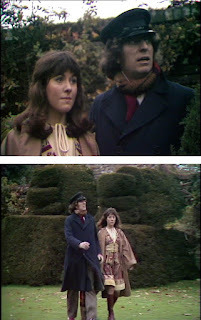 The Doctor gets another new frock coat in this adventure, this time in grey tweed with brown corduroy collar and cuffs and leather elbow patches. The tweed the coat is made out of at first appears to match the trousers he is wearing, however on close inspection his trousers are made of a grey Donegal tweed (see right), while the tweed his coat is made out of has a cross-hatch effect in the weave. He again wears the Prince Of Wales checked velvet waistcoat; the brown fedora; the Victorian styled shirt first seen in the previous adventure; and a new darker red cravat (not to be confused with the terracotta previously worn) tied loosely in a day cravat knot (which is the same as a four-in-hand knot without tucking the end through the last fold). 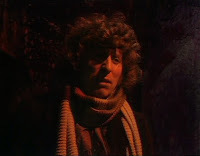 The Doctor is still wearing the Season 13 scarf, however this serial also introduces a duplicate of the Season 13 scarf which is worn by the Android Doctor in scenes in which the two Doctors are on screen together. It is distinguishable by being knit on a smaller needle size and hence being a shorter length than the original. Also the colors are not an exact match, the yellow in particular being brighter and less gold than the original. The new coat has an unusual design quirk. Although it is designed to look like a double-breasted coat, it is not cut wide enough to actually overlap as such and only just meets in the middle as a single-breasted coat would. As a rule it is never seen buttoned up, however, in this adventure this is briefly seen. Two buttons sewn end-to-end and looped through his jacket’s upper-most left buttonhole link the fronts together. In some later stories this linkage is seen hanging in the lower-mot buttonhole. 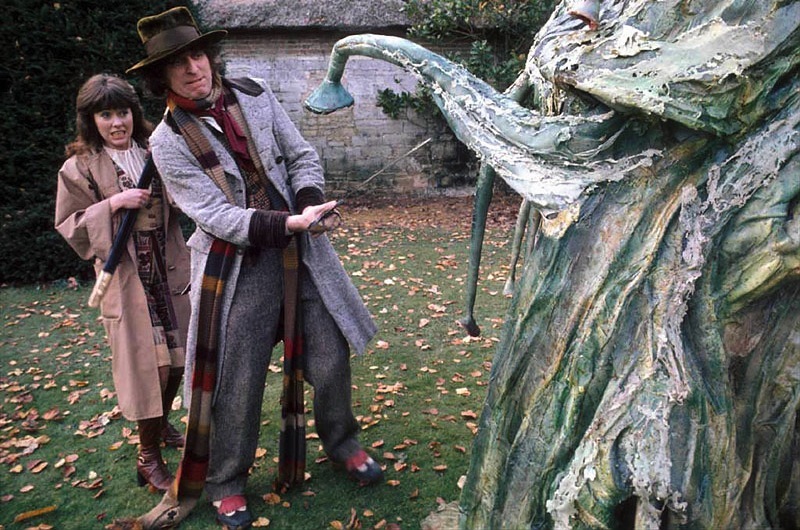 The Doctor starts out this story with the same costume as The Android Invasion, save the introduction of a new, bottle green hat, made with unfinished felt so that it has a varying texture, although due to the darkness of the lighting we don’t get a very good look at it and he takes it off quickly. 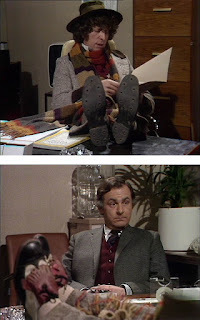 Also (after the second scene in two serials in which the Doctor is tied to a post), he spends a portion of the story wearing his shirt open, his cravat draped untied around his neck, and his vest almost completely unbuttoned. This gives the best view of the unusual shape of the collar to his shirt. Finally, in this story we get a good look at a patch on the large beige section on one end of his scarf (see below). 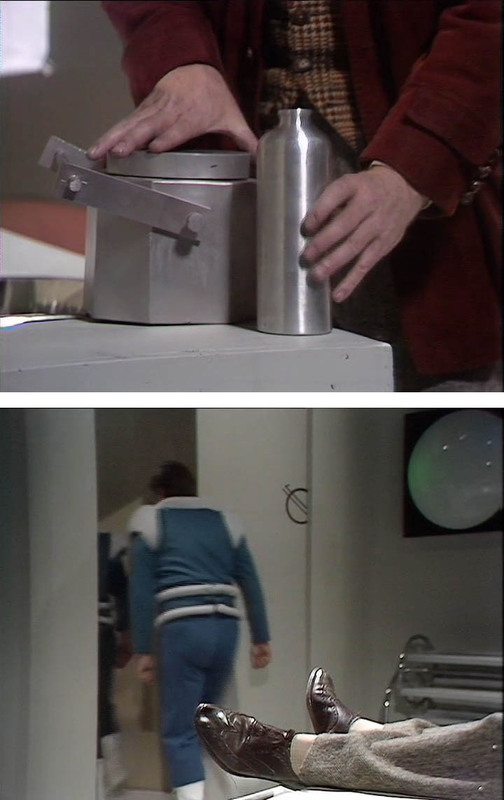 There had been a hole in that panel as far back as Genesis of the Daleks, however from with Terror of the Zygons we get a few glimpses of a large patch presumably put there in an attempt to save that panel (before it is eventually removed during Season 14). 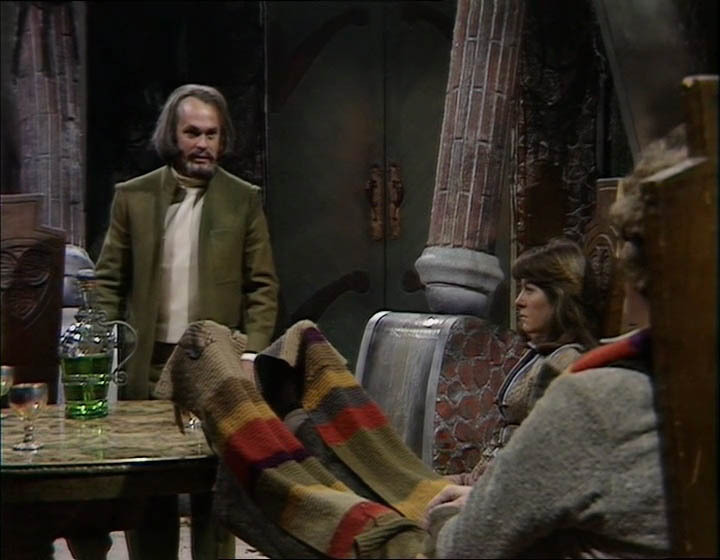 After experimenting with the burgundy velvet frock coat in Pyramids Of Mars, The Doctor now seems to have settled on the tweed frock coat instead, this being the third consecutive adventure it is worn in. On the face of it the rest of the costume remains unchanged, though if you look closely you can see he is wearing a new pair of distinctive shoes. Uncommonly for the Fourth Doctor, he also briefly dons a blue overcoat and matching cap to impersonate a chauffeur and gain entry to Harrison Chase’s mansion. Wanted to point out the shoes in Seeds of Doom are distinct because they are golf shoes. The little holes in the bottom of the soles are for removable cleats.